This is why it pays to be nice...lol. According to HR executive Matt Buckland (pictured above), he said a man pushed past him and told him to go 'f*** himself' as they were both getting off a packed train at Monument Station in central London on Monday Feb. 16th. 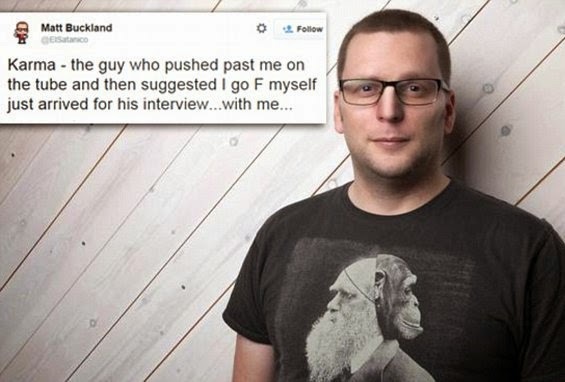 He said the man insulted him because he'd stood aside to let a woman off the train. Thinking he was deliberately standing in the way, the man, a job seeker, pushed him aside and told him to f**k off. "I was on my way into work on the Tube on Monday morning during rush hour. I stood to one side to let a lady get by, and ended up blocking a man momentarily. I think he thought I was just standing in his way. He pushed and I turned, I explained I was getting off too but he pushed past and then looked back and suggested I might like to f*** myself,which might have been true but not before a few cups of coffee' he told Buzzfeed. Well, guess what? Hours later, the same man walked in for an interview at investment firm Forward Partners where Mr Buckland is a senior executive and head of recruitment. The job seeker , who was interviewing for the role of web developer at the firm, didn't recognize Buckland as the man he'd disrespected earlier in the day so Buckland said he started to ask him train-related questions until the penny dropped. Buckland said the man didn't get the job and not because he held the incident against him, but because he wasn't suitable for the job.